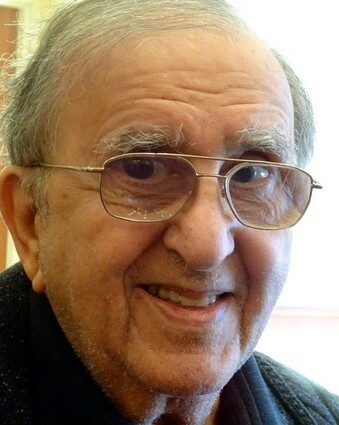 Nelson J. Ayoub, 87, of Downingtown, passed away on Tuesday, January 29, 2019. He was the son of the late George and Marie Ayoub and loving husband of 64 years to Anita Ayoub (née McGear). Nelson was a Korean War veteran who served in the Army Air Corp/US Air Force as a member of the 49th Fighter Bomber Group, 8th Tactical Fighter Squadron. Nelson graduated from Widener University in 1972. He worked for Boeing for 36 years, where his specialized knowledge of helicopter transmissions took him to every continent except Australia, even Antarctica. Outside of work, Nelson enjoyed working on his property and vegetable garden, listening to music, singing, and playing the harmonica. He was a member of the American Legion Post 475 and the VFW Post 845. He was also a founding member of the American Helicopter Museum in West Chester, PA.
Nelson was always “full of the dickens” and quick with a smile. In addition to his wife, Anita, Nelson is survived by his children, Michael Ayoub (Marcie) and Diane Coltrain (Jeffrey); his grandchildren, Daniel Coltrain, Alyssa Coltrain (Brett Robb), Jenna Ayoub, and Jarrod Ayoub; and his siblings, Joanne Moyer (Richard), Norton Ayoub (Rose),Yvonne Bockman (Paul), Raymond Ayoub (Marge), Bill Ayoub (Anne) and Anita Esler (Glen). He was pre-deceased by his sister Helen Adair (Andy). He has many wonderful nieces and nephews as well as great and great-great nieces and nephews. Services for Nelson will be held on Monday, February 11, 2019 at the James J. Terry Funeral Home at 736 E. Lancaster Ave., Downingtown, PA 19335. Family and friends may pay their respects from 10:00AM – 11:00AM and the service will begin at 11:15AM. Interment will follow at Northwood Cemetery. The family would like to thank the staff of Crosslands in Kennett Square for the loving care they provided Nelson during his residence there. In lieu of flowers, donations may be made to the Alzheimer’s Association or the Alzheimer’s Foundation.